In 2004, an epic TV miniseries of the Old West was filmed in the Calgary area. This story, told from the perspectives of a Native American family and a white settler family, has been incredibly well received in Hollywood and, in fact, has been nominated forf a number of prestigious awards. So why am I telling you this? Because the movie is Steven Spielberg's "Into the West" and there were 9 dogs in this outstanding miniseries that were prepped and handled by Lori Boyle, owner of Superdog Spectrum...that's why. Quite an awesome undertaking for Lori considering that Mr. Spielberg has countless big grossing, critically acclaimed credits to his name. "Into the West" has been nominated in the category of Best Mini-Series or Motion Picture Made for Television for several of the awards leading up to the Oscars in February. One of the first awards was the BFCA Critics' Choice Awards early in January, where it went on to be proclaimed the winner in its category! Although there have been a number of dogs who are graduates from the Superdog Spectrum training program that went on to be in show business, I believe this award is a first for any of them. Lori was the obvious choice for Dog Wrangler on "Into the West" as the filming of this TV miniseries came hot on the heels of the filming of the successful remake of "Little House on the Prairie" (see July Newsletter). 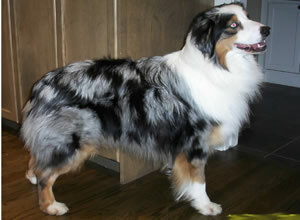 In "Little House", Lori used four different Australian Shepherds to play the Ingall's dog, "Jack". Cowboy, one of the Aussies who doubled for Jack, was a seasoned movie dog by the time he was chosen to work closely with one of the actors in "Into the West". Cowboy was joined on the set of "Into the West" by Caper (veteran of several movies), Zeke, Arnold, Deuteronomy and four other dogs owned by Dona & Ken Robbins. Dona, whose huskies are a favorite in the Superdogs Show at the Calgary Stampede each summer, put all the basic training on Sheba, Shyanne, Kayla & King that made them candidates for their roles as background dogs in "Into the West". You can prepare your dog for the possibility of a future audition by teaching him basic manners...ensuring he knows all the common commands like "come", "sit", "down", "stay", and "wait"....along with a few other commonly used behaviors. Be sure to socialize him to all the same kinds of sights, sounds and crowds he would encounter on a movie set. Joining the training classes at the Superdog Spectrum can help to prepare you and your dog just in case there is a movie call for his kind of furry face. Your dog could find himself working on a movie set with actors like Brad Pitt, Tom Selleck, Kevin Costner or Beau Bridges. We'd like to welcome 2 special ladies to the Staff of the Superdog Dog DayCare! Treacy-Kay Curran remembers always having a love for dogs and although she doesn't have a dog just now, she had a Jack Russell for 14 years. For the time being Treacy bestows all her doggie hugs and snuggles on the dogs at the Spectrum. In the future, Treacy envisions herself owning a dog Dog DayCare, but for the present, she is content to learn as much as possible and is anxious to work toward teaching some of the dog classes. Sherri, our other new Dog DayCare Staff member, has also been an animal lover since she was a child. Sherri brings with her a wealth of animal experience...she has been breeding & showing Pomeranians for 18 years and is interested in producing some of the rarer colors in the breed. As well, Sherri has had experience grooming and working in a pet supply store. Congratulations to Trevor Flood and his JRT for achieving their prestigious "ONYX" title in Flyball at the local tournament held on January 14th and 15th. If one of your New Year's resolutions is to lose weight and get in shape, by all means you should extend that same pledge to your pooch - especially considering obesity is the most common nutrition-related health problem for dogs. So before you take your dog on your daily jog, the first thing to do is talk to your veterinarian to make sure your dog is physically able to run for long distances...and remember, some breeds are not built for this kind of activity. Secondly, it's important that your dog is already fit and close to his ideal weight. View your dog from above. He should have an hourglass figure, with his waist thinner than his ribcage area. If you don't see a narrowing behind his ribcage, he is carrying too much weight. Look at your dog from the side and look for a "tuck up" behind his ribcage at his waist. If his abdomen hangs down without any defined waistline, he is overweight. Feel your dog's ribcage. You should be able to feel his ribs easily through your fingertips. If you feel a thick layer of fat over his ribs, he weighs more than he should. If you aren't sure about your dog's weight, take him to your veterinarian for an examination. Your vet can tell you once and for all if your dog needs to go on a diet. If your veterinarian determines that your dog is overweight and out of shape, it's time to embark on a diet and exercise regimen. First, ask the veterinarian to give your dog a complete check up to make certain your pet is healthy enough to undergo a change in diet and adopt a new exercise routine. Your vet will most likely run a blood test, listen to your dog's heart and lungs, and palpate his internal organs. Feed your dog a healthy diet, recommended by your veterinarian. Your dog needs to get a jump-start on losing weight and a low-calorie diet might set him on the right track. Start building your dog's fitness level after he has lost some of his excess weight. If your dog is very heavy, he will need to take off a few pounds before you can safely increase his exercise. Make sure your dog can walk and breathe easily before you boost his exercise level. Plan a daily exercise routine for your dog. If your dog has been living a very sedate lifestyle, start slow with a walk around the block each day, gradually increasing the distance of your walks every week. Monitor your dog's weight closely with the help of your veterinarian. Once your dog reaches his ideal weight, your vet may recommend changing your dog's diet and/or quantity of food to help maintain his new, fit and trim self.